Mass murderer Elliot Rodger was using legally purchased guns and legal 10-round limit ammo during his killing spree. California passed 10-round magazine capacity laws in 2013. 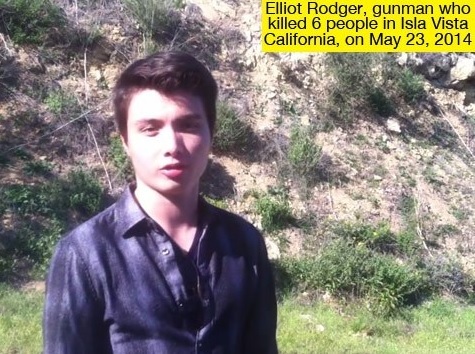 Elliot Rodger stabbed three roommates to death then shot three students dead at UCSB. Rodger tipped off his parents and therapists of his deadly intentions. His parents frantically tried to locate their son during killing spree. The parents of Santa Barbara shooter Elliot Rodger had read his chilling manifesto and were frantically trying to stop their son carry out his plan when they heard of the massacre on the radio, it emerged Sunday. Lichin Rodger, the suspect’s mother, reportedly received the email at 9.17pm and immediately went on to her son’s YouTube page where she found the newly uploaded video titled ‘Retribution’ which describes his plan of ‘slaughtering’ women at a sorority house at the University of California at Santa Barbara. According to CNN, Mrs Rodger then alerted her estranged husband, Peter, and after he watched the video she called 911. The former couple then set off from Los Angeles to Santa Barbara to try find their son. But they were too late, and, according to Mr Astaire, they heard about the shooting en route. Later that night, their worst fears were confirmed when they were told their son was behind the massacre that left six victims dead and 13 injured.